Multiply those numbers by the market price per unit of Heavy Water and you'll see that securing a steady supply of Heavy Water is important. It could turn out that the corp you join or the alliance already has an around-the-clock perfect Rorq booster sitting in a POS at your disposal. However, it's also a good possibility that if you have a perfect Rorq booster you'll end up being the player with a character boosting in that POS. While it seems there are quite a few Rorq pilots out there, not that many are "perfect" boosters. By "perfect" you could mean all the related mining leadership skills, Rorq ship skills and Mining Foreman Mindlink, but having all the leadership skills to 5 brings further benefits (+10%) with respect to agility, targeting range, targeting speed, shield amount and armor amount - all nice bonuses. When you work a nullsec ice anomaly, focus on Glare Crust as it will yield the highest amount of Heavy Water. Ice anomalies have no connection to sov or sov upgrades - like highsec, a system either offers an ice anom or two, or it doesn't. Nullsec ice anoms spawn with the same frequency as those in highsec. Go HERE for a quick snapshot of what's happening with ice variations and ice products. The bonuses you will receive from a perfect Rorq plus the value of upgraded sov ore and the yield of a Hulk work together to make nullsec mining much, much more profitable than highsec. The discussion is about multi-box mining only. Not a fan of solo mining anywhere, but that's especially true in null. If you must remain solo, give some thought to developing a ratting pilot. Mining makes great ISK if you use multiple miners as it scales well - easy to add more miners without much added effort. Solo mining will prove to be a pain in the neck to you and probably those around you. The roles: miner, hauler, booster and one more not previously mentioned anywhere on this blog - prober. As having a probing toon isn't discussed often when it comes to mining, let's look at why. My setup includes 4-6 Hulks (or Skiffs depending) on grid at the anom for extended periods of time. That's a lot of ISK and fairly slow aligning ships. Intel is key. Local isn't the main point, I want to know way in advance if non-blues are in the neighborhood. If I haven't started warping before they enter local, it might be too late. Intel is usually provided by alliance or coalition channels, maybe corp channels. The quality of such intel varies greatly from group to group and even moment to moment, depending on how many people are online, where they are located, and how much attention they're paying to their own local. Prime is to have the system in which you're actively mining "boxed," which means you have eyes, or at least eyes you can really count on, in every adjoining system so no one can get into your active system without being seen by scouts first. Boxing a system is great. Intel is great. But there's one thing that can ruin all of this - wormholes (WHs). Cosmic Signatures that you have to probe down to identify and locate. They might be data, relic, or combat sites - or they could be WHs. WHs are a very popular way for PvP groups to quickly roam about with very little advance warning - and almost no warning if a wormhole they can jump through spawns in your system. Thus, your probing alt. Whenever a previously unidentified Cosmic Signature appears in your active system, you want to know if it's a WH or a non-threatening PVE site and, if it's a WH, to where it leads, size, and likely lifespan. When there is a WH in your active system your fleet is at risk to a sudden hostile group jumping in without prior warning. If you keep good track of the WH sigs in your active system, you might make the logistics folks in your corp happy as often a WH chain will lead to a good high or low sec system not far from a market hub. Your PvP folks might appreciate the heads-up also as they can use them for a roam. What to do when a WH sig appears? Responses by miners vary, maybe due to risk management, complacency, greed, or some mix. Some do nothing different. Some completely stand down. Personally, I usually switch to Skiffs for a faster alignment time. Also note, WHs make intel channels questionable because WHs can pop up anywhere. You might have a lot of systems covered in your intel channels, but what if a WH pops up next door or close by and there are no reliable eyes between you and that system? Box your active system if at all possible - I'll often sacrifice a miner to do scout duty, or rotate scout duty among corpmates who are also mining, etc. It's easy to get complacent and lazy. It's also expensive. This is anti-climatic: What I have on grid at all times during the mining session are 4-6 Hulks. The booster is in a Rorqual sitting in a POS. The hauler warps in, scoops what's available and warps to the POS where he either dumps it in a compression array or in the fleet hangar of the Rorq, which can also compress ore. I prefer a compression array as it can hold 20 million m3 or ore, but either way works. Note: I prefer to work out of a POS as opposed to being tethered to a Citadel. Don't want the Rorq bumped off the Citadel and don't want to have to dock to offload the ore (storage space on the Rorq, which is maxed out for cargo, is for Heavy Water and the ore hold is just too small). A small POS can give me a compression array and corporate hangar where I keep mining gear. Make sure it's stronted, and just take it down if attacked. The questions are, if I'm using Hulks with their small ore holds and keep nothing on grid with them, like an Orca, to put their ore in, how does that work? 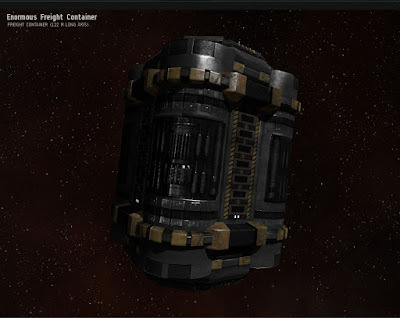 Enter the star of our show, the Enormous Freight Container. That's right, I'm jet can mining in nullsec. But this a very fine jet can - each Enormous Freight Container (EFC) can hold 250,000 m3 of ore! They're a weird thing. Packaged, they're only 2,500 m3 so you can deploy them with a T1 Industrial, but when launched, they blossom to the 250K m3 capacity. When I'm about to start a mining session, I send my lead miner to an ore anom with the Rorq running boosts in the POS and the rest of my miners waiting there, do a survey, and pick a good spot that will put me in laser range of the Bistot, Arkonor and Mercoxit, at least the bulk of it, then warp the hauler in, launch the EFC, bookmark it and warp back to the POS. Until I've depleted the sweet ore within range of the launched EFC, I'll warp the hauler in to clear it out as need be. Note: Your miners and hauler will want to set their HUD safety to red so they can all access the EFC. Note: I make a bookmark off-grid to the ore anom (which is now a pain due to the grid size) and warp my mining crew there from the POS before going directly to the EFC bookmark at the anom. The reason is, it's often many AU between POS and EFC bookmark and it's a horrible feeling to see local fill up while you're in a 30 AU warp with a fleet of Hulks. What ship I use to haul with varies, but usually either an Orca maxed for cargo or a Miasmos. The Orca is the easiest as it can hold 190K m3 of ore among its three holds if maxed out for cargo, but it's also slower to align. The Miasmos is cheap and aligns quickly, but holds less than 60K m3 of ore. If intel's been a little dicey I'll probably use the Miasmos, but prefer the Orca. Some folks will use a freighter. I don't. Note: If you want to pick up your EFC at the end of a session, you will have to use a freighter because it's now 250K m3 in size and will remain that size even if empty until it's repackaged. I don't bother. I leave them at the anom, rename them to something like "Feel free to use" and not worry about it. They disappear after downtime but are very cheap and easy to build (suggest you have a BPO, they're also relatively cheap). If you're a serious multi-boxer, and by serious I simply mean really enjoy it and are willing to make a bit of effort to situate yourself, you should be in sov nullsec. Yes, sov null right now due to fozziesov is a bit unstable, but while no one can guarantee eternal stability if you do your homework it's possible to find a home in null that will take your game to a much higher level of enjoyment (and ISK generation).